Ours is not to question why Running With Scissors, the American development team behind the hugely polemical Postal series, wanted to make another expansion for Postal 2 after 12 full years. To be fair it was probably to get something out after Postal 3 had met with abject disaster. Postal 2 was the game that successfully established New ZEALand officials really do have a ZEAL for censoring stuff, making sure to ban it about as hard as cocaine ($1400 for possession). Its fans, though, were likely to bang it as hard as ditto. In Paradise Lost, your first task is to track down your dog that's gone missing while you lay comatose in a ward. Best time on Very Hard difficulty: 1:18:50 by Nikita 'NWill' Abramov on 2015-05-02, done in 35 segments appended to one file. 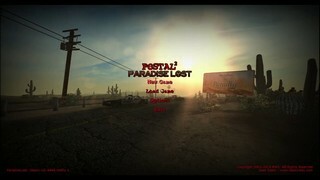 First Postal 2 Paradise Lost speedrun on very hard. All glithes and skips in Paradise Lost were found by myself. There are more glitches in PL but I haven't find the way to exploit them, if you are intrested in that, feel free to send me a message. Special thanks to Egor "LEAF" Sergiyenko for affording me his PC and for mental support. Also thanks Drammo for rendering all that videos. Thank you, RWS, for making such a great add-on for a very cool game. Thank you, SDA, for your verification and support.